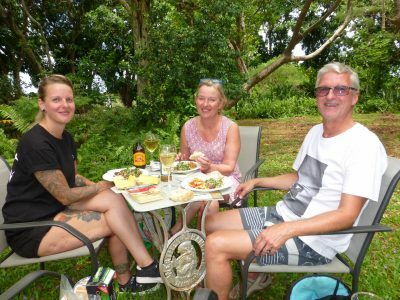 A CASUAL LUNCH, A GLASS OF WINE, A LEAFY GARDEN…. Our cellar door is part of our lovely old Queenslander built in 1911. 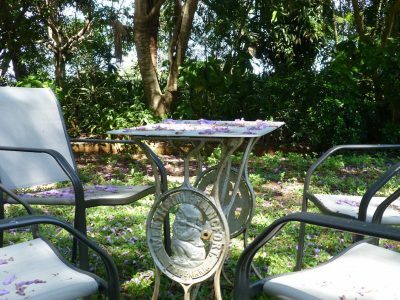 The garden is home to several magnificent old trees including the gorgeous Jacarandas which carpet the lawn with purple blossoms. It is a beautiful spot to sit and enjoy a glass of our HILL OF PROMISE award-winning preservative-free wines or some good Vittoria Coffee after a wine-tasting. Pick up a quiche or breadstick in town, add in some tasty cheese and a pickle or relish ….. and you have a feast! 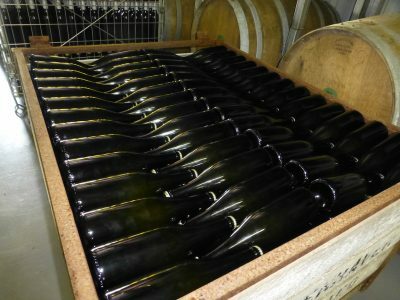 Remember the Princesses in the Tower I wrote about in early September (well, that’s how I described the secondary fermentation stage of our latest 3 Marys Sparkling) One of the exciting times in the winery is progressive testing by TERRANZO THE WINERMAKER and the CELLAR RAT. The crown seal is carefully prised off, the contents are carefully poured into the glass….. it’s like a mini-fireworks, only better. Fine streams of pearly bubbles escape to the surface and wink at you. You take a sip…. mamma mia, deliciosa!! Back to sleep for another 4 weeks, final beauty treatment and release in December. sogni d’oro!! Hope you are enjoying some of the glorious ‘SPRUMMER’ weather that we are feasting on…. crisper cool mornings and evenings with beautiful balmy days in between. In fact, ideal weather to get out the Webber or fire up the barbecue. Whether it’s seafood, chicken, beef, lamb or ‘that other white meat’ pork OR char-grilled capsicum, eggplant, corn, tomatoes…. the variety is endless. Match your favourites up with one of ‘HILL OF PROMISE’ whites or reds. Send Winter packing, roll out the Welcome mat for Spring. 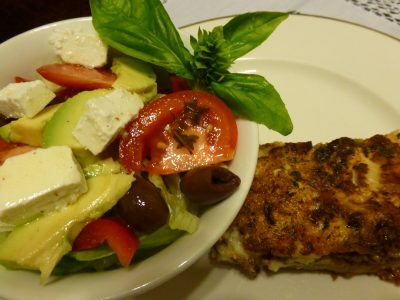 Great night ….. delicious food, amazing wines, wonderful guests. Just the way to kick off the Festival! The winery was transformed with fairy lights and candles. 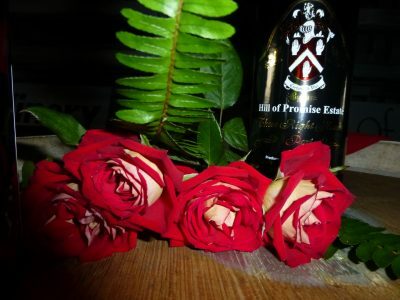 Catch us on FACEBOOK: HILL OF PROMISE WINERY. 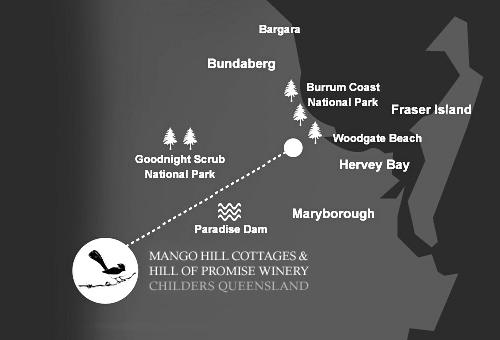 Next major HILL OF PROMISE WINERY function is FAREWELL WINTER, HELLO SPRING LONG TABLE LUNCH SUNDAY 04 SEPTEMBER… And Yes, that’s FATHER’S DAY. Bookings open soon! 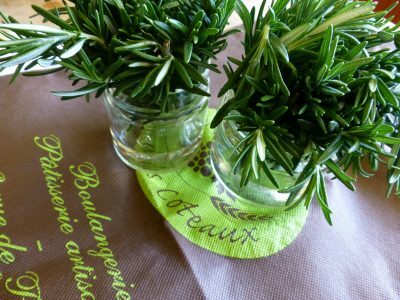 The rosemary and thyme have been cut and a heady perfume fills the air, wonderful fresh produce has been picked up from our local suppliers and delicious aromas are drifting from the winery kitchen. 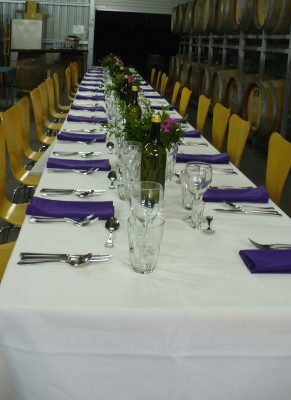 We are so looking forward to 42 guests coming to share the LONG TABLE DINNER IN THE WINERY tomorrow evening. The buzz of conversation, laughter, tinkling of cutlery on plates, the clinking of glasses as old friends and new celebrate the season and share a meal….. aren’t we privileged! What better way to celebrate and KICK OFF THE 2016 CHILDERS FESTIVAL than by joining us in the WINERY for a LONG TABLE DINNER on FRIDAY 29TH JULY. 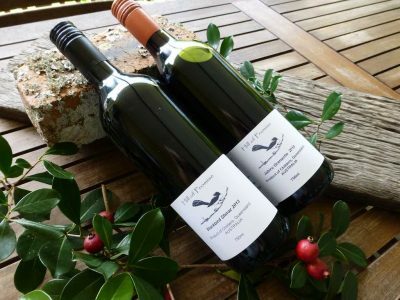 On offer ….. 3-COURSES based on lOCAL, SEASONAL PRODUCE matched with our AWARD-WINNING, PRESERVATIVE-FREE WINES, FORTIFIEDS AND SPARKLING. Get a group of friends or colleagues together or come along on your own and make some new friends! ALL THIS IN THE AMBIENCE OF A WORKING WINERY! Please advise of any dietary requirements when booking. Come and celebrate WINTERFEAST with us here @ HILL OF PROMISE WINERY. What’s WINTERFEAST? It’s Queensland’s newest culinary tourism product for the Bundaberg Region and it celebrates authentic farm gate to plate dishes from Australia’s food bowl. We are excited to be part of this two-week event with ‘TASTINGS ON THE TERRACE’ on MONDAY (YES! MONDAY ) 11TH JULY 2016 starting at noon and finishing around 3pm. Take advantage of our gorgeous winter weather to enjoy a casual, light 2 course lunch with a distinctly Italian theme in the ambience of a local working winery. 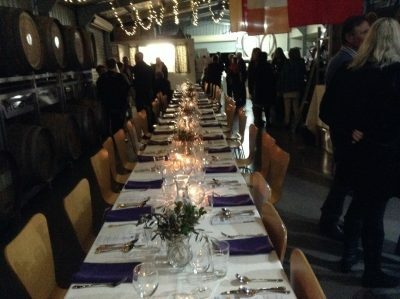 Guests can purchase tickets $45.00 pp through www.winterfeast.com.au.